In case you regularly clean the interior areas in your car you can use our services to refresh and steam clean your upholstery. Rarely washed car upholstery pieces need deeper sanitising to be rid of all pollutants. 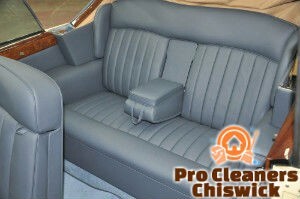 Our company provides excellent services that ensure reliable car upholstery cleaning in Chiswick with long-lasting effect. Our team of cleaners are well motivated, background checked and qualified. They can make your car seats, carpets, mats, headrests and luggage areas refreshed and deep cleaned. We guarantee you that you will have thoroughly and deeply washed and disinfected car seats and upholstery after our cleaners do the necessary procedures. The cleaning starts with brushing the visible dirt from the car interior. Our staff hoover the seats, mats and luggage department and apply a spray over them. The cleaning solution is left to work for a while and hoovered with vacuum cleaners with brush attachments. Our staff provide hot water extraction to disinfect the fabrics. They dry the upholstery using powerful industrial driers. The car seats and surfaces are sprayed with suitable stain and spot removing preparations. Make your car look better by having it sanitised professionally using our effective car upholstery cleaning services, available in W4 from Monday to Sunday. Natural and synthetic leather surfaces will be sanitised with the help of suitable detergents and a soft clean cloth. Our staff will wipe the leather upholstery well using the detergent and apply a moisturising agent over it. In the end the interior of the car will be deodorised and refreshed. 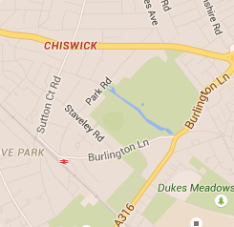 Our car upholstery cleaning services can be booked by the Chiswick residents and those living nearby. Use our call centre or booking form to schedule the washing and cleaning of the upholstery in your vehicle.